Alstom celebrated, with VLT Carioca concession company  and the city of Rio de Janeiro, the start of operations of its first tramway line, on time for the summer Olympic Games. The inauguration took place on Sunday 5 June in the presence of Eduardo Paes, Mayor of Rio de Janeiro and Michel Boccaccio, Senior Vice President of Alstom in Latin America. Alstom is proud to deliver Rios tramway line in time for the summer Olympic Games. This is a great moment for its residents and for visitors coming from all over the world as the tramway will help to reduce congestion and pollution while offering a transport mode that is comfortable, reliable and efficiently connected to other forms of mobility, says Michel Boccaccio. The Rio tramway network consists of three lines covering more than 28 kilometres, with 31 stations. The portion of the line that is opened covers a distance of 7 kilometres connecting Santos Dumont to Parada dos Museus (Praça Maua). The 7 other kilometres  will open before the beginning of the Olympic Games. 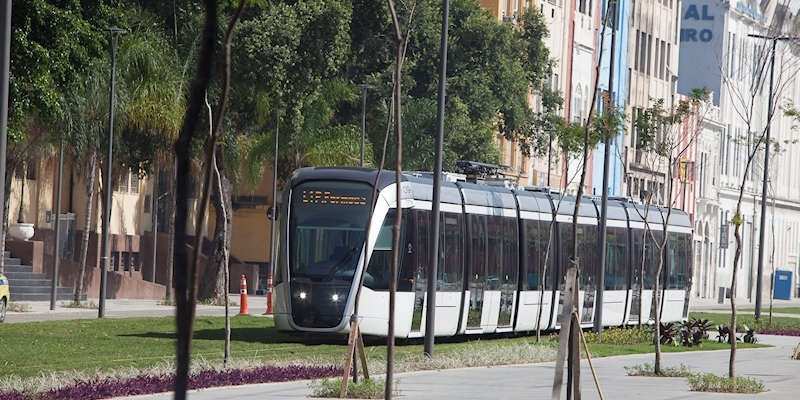 Well connected to other modes of transport, the tramway lines will significantly improve traffic in downtown Rio. The tramway project - which was initiated by the municipality of Rio to modernise the port area - was awarded to Alstom by the VLT Carioca consortium in September 2013.Alstom is responsible for providing a full integrated tramway system which includes: 32 Citadis trams, electrification, signalling, telecommunications and depot equipment. To preserve and restore Rios authentic architecture, VLT Carioca has opted for Alstoms catenary-free power solution combining two innovative technologies: APS, which supplies power via a third rail on the ground and Supercapacitors, modules installed on the roof of the tram which store and regenerate energy. Made up of seven cars, the 44 metre-long Citadis tram is able to carry up to 420 passengers at a time and up to 200,000 passengers per day. The first five trams were designed and made in La Rochelle in France while the 27 others are being manufactured in Taubaté, the first tram factory in Brazil. Alstom masters every stage of tramway system, from design to complete validation and commissioning and maintenance. The company is leader in the supply of integrated tramway system and was recently awarded projects in cities like: Cuenca in Ecuador, Lusail in Qatar, Ouargla, Mostaganem in Algeria, or Sydney in Australia. The tramway line will be fully operational in 2017.